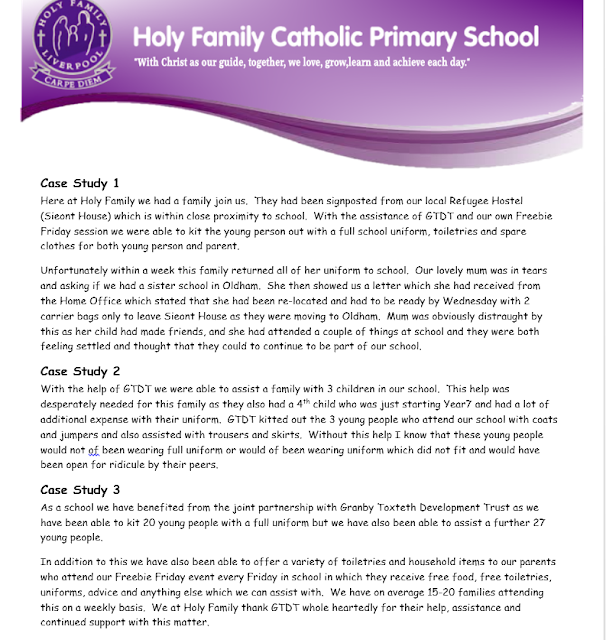 Yesterday I received a lovely email from Dawn who is the Holy Family schools Family liaison officer. We have been working together for quite some time, infact we got chatting last summer when I popped down to the school to talk to the head mistress about the school garden, so really it was just by chance that Dawn and I got chatting and it was about the same time that Dawn was starting to run her freebie Fridays. She started the freebie Fridays when she identified families in severe hardship and had found that some children and families are going without warm food of a weekend and some children do not have any school uniforms. So that is when GTDT got involved. We managed to get free school uniforms from a local supplier Fitwell, we offered energy and money matters advice, gave away pre loved clothing, parcelled up toiletry and nappy bags, gave out veg bags and slow cookers, organised craft session for parents so that they are able to make and sell their crafts at half term fairs to raise money for their group and every fortnight someone from the team goes along to the Freebie Friday to see if there is anything else that we can help with. I have asked Dawn permission to attach the case study, so here you go.